The big question is always: what do we do with it all?! I am going to give you some suggestions of things that we have done, or are currently doing, that may help if you are still battling all the paperwork in your home. We don’t exactly have this whole paperwork thing figured out in our home and it is something I am working on improving. But over the years, I have put some systems in place that have definitely helped. 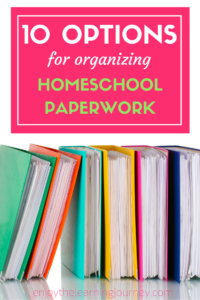 Take a look at these 10 options for organizing homeschool paperwork and see if any of them will work well for you! I saw the idea of fabric storage cubes with snap closure poly envelopes on a homeschool website years ago and I’m sorry to say that I don’t remember which one. 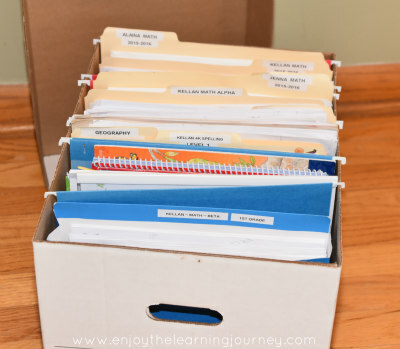 It’s a great solution for organizing unit study papers, especially when you might have papers of various sizes or a lot of papers that won’t all fit into a regular file folder. 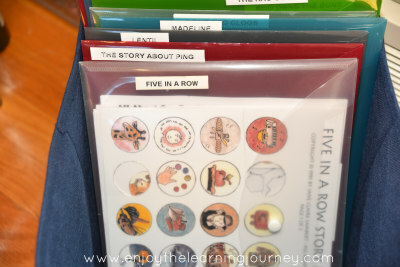 If you use the Five in a Row curriculum, you can designate a folder for each book or “row”. 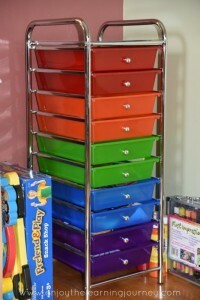 This 10-Drawer Organizer is something I couldn’t have gone without these past several years of homeschooling. It isn’t very sturdy and won’t work for anything too heavy but it is perfect for storing papers, stickers, smocks, etc. I typically have one drawer with blank paper, one with stickers, one with tracing templates, a few with completed work, two with blank journal pages and other blank notebooking pages and worksheets. We’ve had different curriculum choices over the years so the number of binders I use depends a lot on that. Typically I’ve used them to organize my paperwork but last year I added binders for the kids too. These binders are used for storing their best work. After 3-hole punching papers that we didn’t really want to damage I realized we needed sheet protectors so now we put everything in sheet protectors before adding them to the binder. 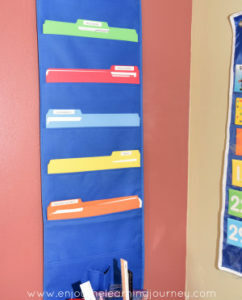 This year we added a hanging file organizer for the wall. While I haven’t fully optimized it’s usefulness yet, it’s definitely helped to keep paperwork clutter to a minimum. I typically put the paperwork we use most often in folders that I keep in this organizer. So, the paperwork that goes in there are Math U See worksheets, Geography pages, and other printables we use for mini-units. Trays can be great for lots of things so I added stacking letter trays right next to our computer to keep printables that I need on a regular basis like blank paper, card stock and printable schedules. 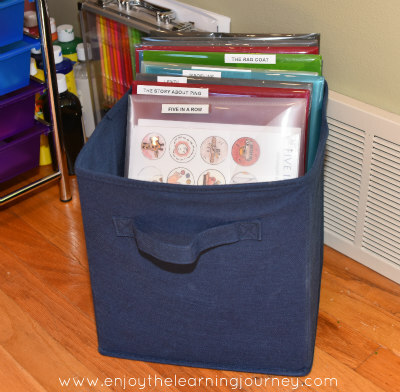 From what I’ve seen, quite a few families use a file tote or file box with hanging files for their homeschool. We personally haven’t just because we have other systems in place but I can definitely see using a file box in the future. 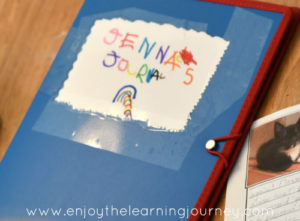 We use individual notebooks for daily journals, Draw Write Now, spelling and an outside nature study class. 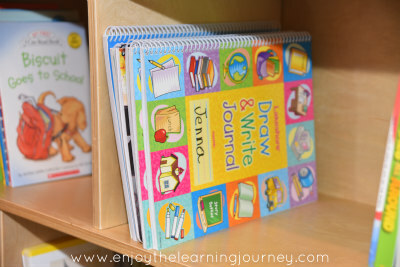 We put all (or most) of those notebooks on a shelf in our school room so they can be pulled out as needed. Kellan used a workbox for 2 years and it worked very well for us. But as curriculum changed and I added my girls to our schedule, we’ve now moved away from it. But for that time period we kept most of his work in a bin with his name on it. His notebooks, folders, worksheets, pencils, erasers, crayons (small box) and markers (small box) were all kept in a single bin with his name on it. I would create a schedule for him each week to follow and include that in the bin as well. I haven’t used an accordion file for homeschooling but have used it for other purposes and it certainly came in handy. 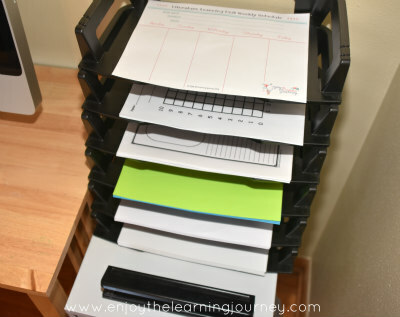 I could see using this to keep papers organized by child or use one accordion file per child and use tabs for each subject. After the school year is over it feels great to put all the children’s paperwork in a spot that’s tucked away but accessible. I put their work in folders by child and subject and then put it into a cardboard banker’s box. 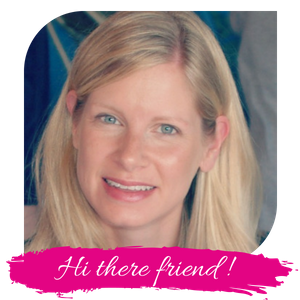 If you missed the previous posts in this series, be sure to head on over to Homeschool Organization ~ 5 Days of Tools & Tips. 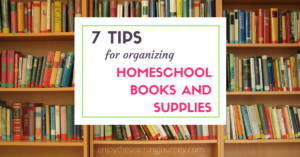 Or move on to the next post in the series, 7 Tips for Organizing Homeschool Books & Supplies.